Who will break our tie? Cecil's life hangs in the balance! You've got a solid team. Leave him behind! 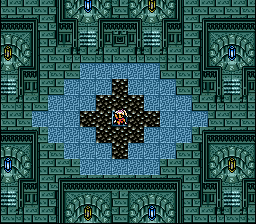 For lack of any other option, we are headed to the final dungeon of the game. This is a huge cache of bosses and trapped chests. 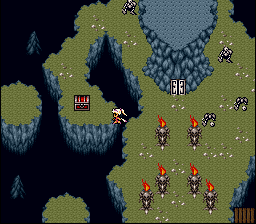 The lunar bosses all roll together, not least because they all have the same overworld graphic. I think this is the Ogopogo slot. But it doesn't really matter, because now it is the Mini Dark Imps slot. Under the N2 flag, the Dark Imps are status-immune and can pose an enormous threat in the right slot. This isn't it; they're only hitting the front row for a few hundred. Well! It's time to say goodbye to the moon, at least for a little while. 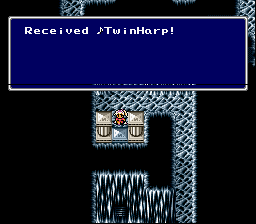 The TwinHarp lets us challenge the Dark Elf, or whoever's taking his spot. Psst! Somewhere along the line, I missed recording a couple of key items. It shows you your total when you save your game, which is the only reason I know that I was off. 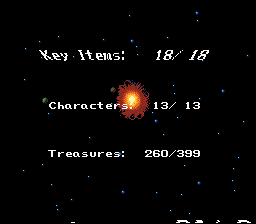 Good thing, too, or I'd have spent hours scouring the corners of earth and moon looking for a key item that doesn't exist! 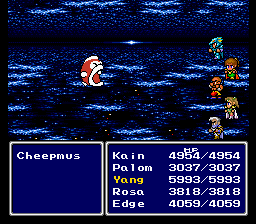 Crystal: We need this to fight Zeromus. 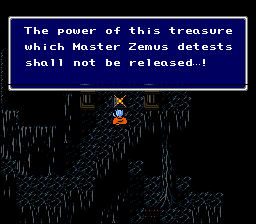 Pass: We can use this to get to Zemus from Toroia. 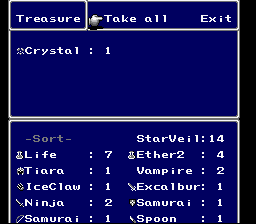 Darkness Crystal: We traded this for a Lunar Whale. 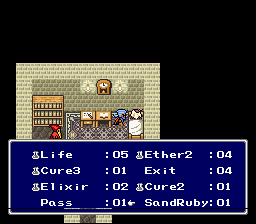 Earth Crystal: We used this to finish Zot. TwinHarp: You're looking at it. Package: We blew up Mist and got ourselves a Karate. Baron Key: It opened up Baron. Magma Key: It opened up a mountain. Tower Key: It opened up the Bab-il control room. 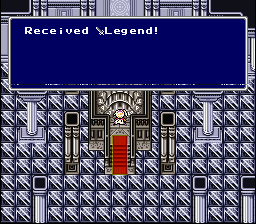 Luca Key: It opened up the Sealed Cave. Adamant: When we get the Legend Sword, we can trade that and this for a sword we can't use. Pan: We hit Yang in the head. Spoon: Edge can throw this. Rat Tail: We gave this to a collector. Pink Tail: We gave this to a collector. 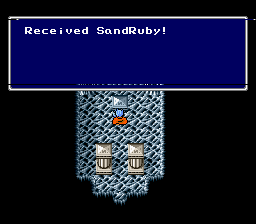 That leaves only the Legend Sword and the Sand Ruby. 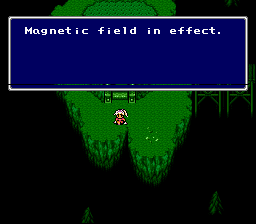 Because random encounters are disabled, the magnetic field doesn't mean much. 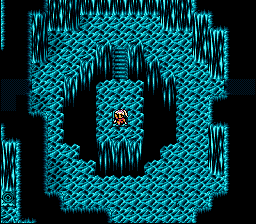 PRO FF4 SPEEDRUNNING STRATS: You can walk right across this gap! ACTUAL FF4 SPEEDRUNNING STRATS: You can skip this chest entirely! 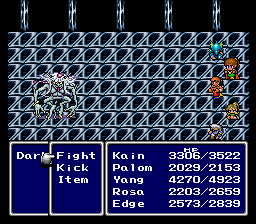 I said the magnetic field doesn't mean much, but it does matter slightly, because if everyone's tied down at the start of this fight, you can skip the first part of the Dark Elf fight. 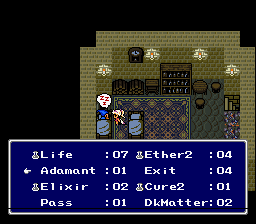 Otherwise, you have to wait for him to cast a few spells and "defeat" you. One of the nice little touches in Free Enterprise is that Edward's song is replaced with a harp arrangement of another song, chosen at random when the seed is created. 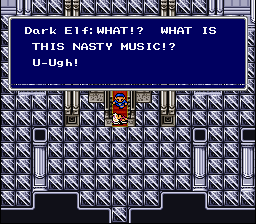 This time, I get to enjoy the Final Fantasy 5 theme, though you'll have to take my word for it. 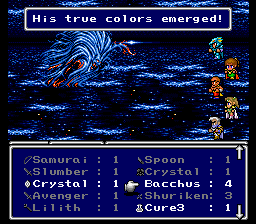 Valvalis is whatever. She might have been tricky 40 levels ago. 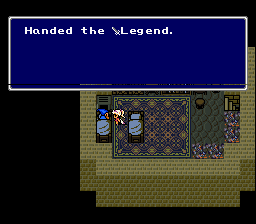 We score the Legend Sword. That's a key item right there! Why bother trading these off? Well, there are two good reasons: first, it frees up two inventory slots, and second, it opens up a new store with endgame equipment. 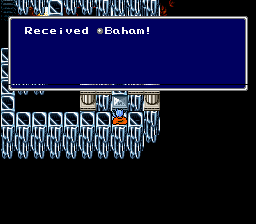 Sadly, it's bad endgame equipment. The last key item is on the moon. 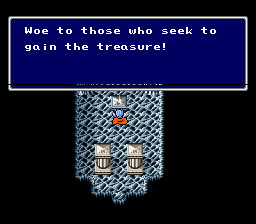 There's not a ton of incentive for this party to trawl through the trapped boxes, especially when they're giving armor we can't use, but there's always the chance we get something nice. I eventually find a Dragoon Spear, which is one point weaker than the Rune Axe but frees one of Kain's hands for the use of a shield. It might also hit dragons for extra damage or boost Jump or something. I dunno. 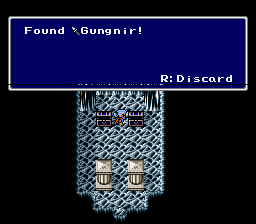 In Wyvern's slot, we find Golbez. 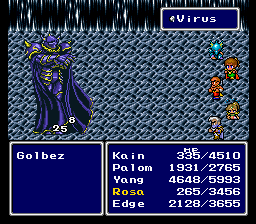 Golbez has the potential to be terrifying. He opens up the battle by killing all but two of your party, and from there, he does nothing but launch mid-level spells at you. At least, that's how this fight is meant to go. 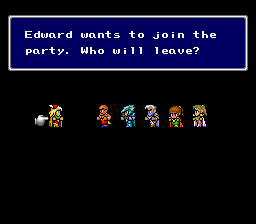 In practice, as anyone familiar with FF4 might know, it's possible to get your party out of harm's way before they get Demolished. Wyvern is a rather slow slot, which affords you a chance to throw up a Wall before the opening MegaNuke. Guess what else is reflectable. That's right, it's Demolish! 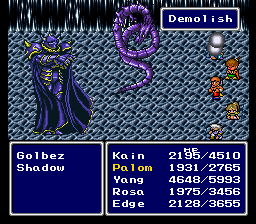 And while neither Golbez nor Shadow can be Demolished, it wastes an instant death attack that was meant for your party. Shadow leaves us with only one party member actually down. Kain gets revived in the time it takes him to kill Rosa. 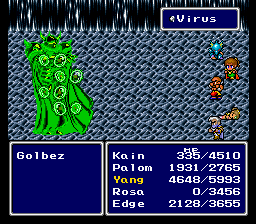 Golbez attempts to cast Virus on Yang, and we get a peek at the other reason he won't be winning this fight: Wyvern has an abysmal Magic stat. 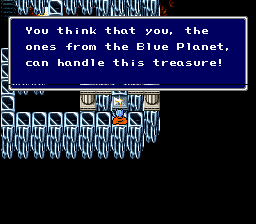 That's the only reason you can usually survive its MegaNuke, and it means Golbez has no offense to speak of. Even if he did, throwing up Wall on everyone is enough to see this battle through. 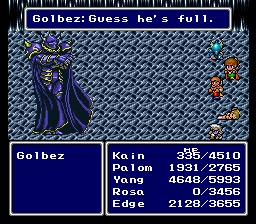 It's only when Golbez is extremely fast or you don't have access to Wall that he gives you problems. 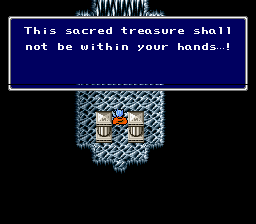 But when the conditions are right, Golbez can be the nastiest boss in the game under these flags. This isn't a key item. Odin takes Plague's spot. While Odin hits like a truck, Yang hits way harder, nearly reaching the damage cap. This is probably because he's got a LitClaw and Odin is super weak to Lit. This is about four times what Yang generally does. 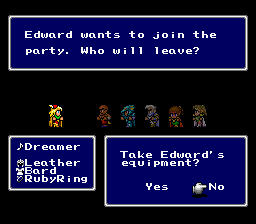 Edward is the second-worst character in the game. There's astonishingly little to recommend here. On the plus side, Edward's Hide command is a free ticket through some potentially tricky battles, such as Dark Knight Cecil or Bahamut. Besides that, Edward can deal excellent damage when equipped with the Artemis Bow and Artemis Arrows. 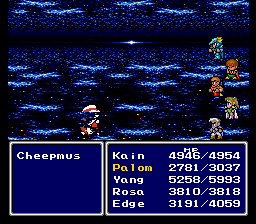 In the Talking Time race a few months ago, I actually took Edward to Zeromus, and he was a strong contributor throughout the game. But the circumstances were very different there. That seed had more generous flags for treasure and stores. We got an early Artemis Bow, Mist had Artemis Arrows for sale, and, vitally, I was able to find Gold Apples to increase Edward's meager health. Without that extra help, Edward is very unlikely to survive a single Big Bang from Zeromus. 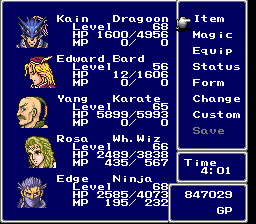 The rest of the party has reached level 65, a truly ridiculous level. 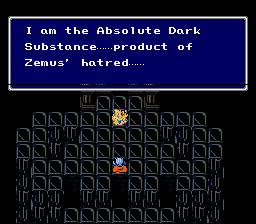 We could have taken Zeromus 20 levels ago. 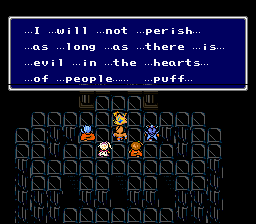 I doubt there's enough experience left in the game to get Edward up to snuff. 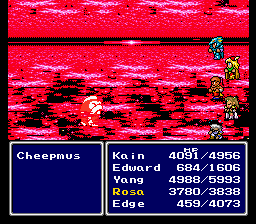 That said, our team is strong enough to weather the loss of any one character without concern -- with the exception of Rosa. And even then, if I find Cure3s for sale somewhere, we could get by. I'm not a cruel person. Leave the bard. Depending on what flags you play, it can also be relatively likely that you have Adamant Armor or a Ribbon on essential characters by the time you fight Golbez, further blocking Demolish. I remember it often being a non-issue, though it's an interesting example of how the tricks needed for a fast run can vary a lot between seeds. Dump Edward, it doesn't sound very interesting to just have him faceplant. No reason to incur a penalty for being bard. Away with you, Edward. Pour one out for Edward. In what I think is the Lunar D spot, we find Ogopogo. Ogo opens the fight by firing off two shots of Big Wave. 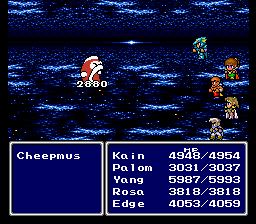 Each Big Wave deals 25% of the target's max health in damage, so we start this battle off taking roughly 10,000 damage across the party. Rosa can't even keep up with that sort of damage! 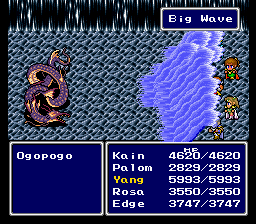 But fortunately, Ogo doesn't use Big Wave very often. 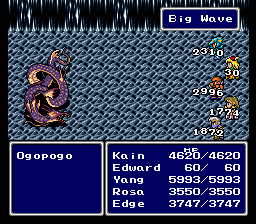 Ogopogo counters magic with Blaze, which is also a percentage-based attack. It's weaker than Big Wave, and it's certainly not strong enough to keep Palom from casting Nuke. 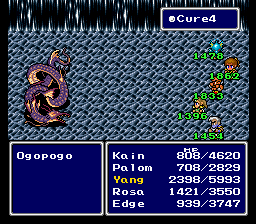 Because Ogopogo's main offense scales with your party, he can potentially be threatening in any slot. 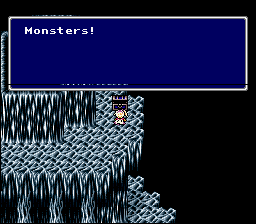 We're overleveled for Zeromus, much less his cohorts, so we don't really feel the threat. We get some fodder for Edge's Dart command. 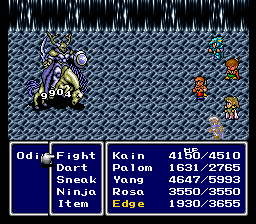 Gungnir is a bit weaker than the Dragoon Spear, but it does give Kain a noticeable boost to defense. Because we're not worried about Kain's survival at this point, we'll stick with what we have. 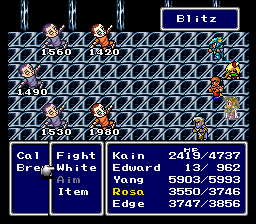 In this, the last boss slot, we find a bunch of marionettes that fall to a single Quake. 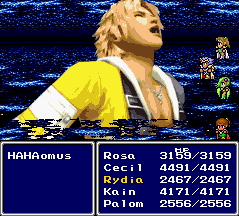 It's time for the final confrontation, you see, and Bahamut wouldn't have done us any good here even if we had hung on to Rydia. 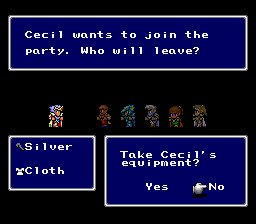 In FF4, the Crystal has no effect unless Cecil uses it. In Free Enterprise, anyone can use it. 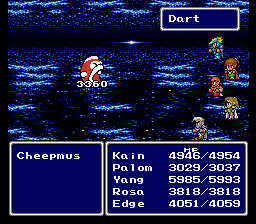 When Zeromus transforms, all of your buffs are wiped away. Hang on to your Berserks until the fight really begins. Now, if I'd been thinking of it, I could've had Kain equip the Avenger in this phase for perma-Berserk, which can't be dispelled. Oh well. The Zeromus flag has only one setting. I mean, you could turn it off, but why would you? 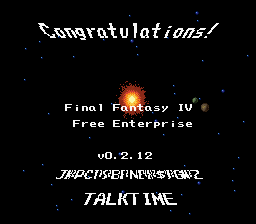 After all, this is half the reason you play a Free Enterprise run to completion. Our opponent in this fight will be Boss Bass. Or maybe Big Bertha. Hard to say. 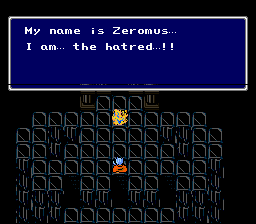 That's right: the Zeromus flag randomizes the appearance of the final boss. Some of these options are amazing. Regardless of the Z flag, the big guy's behavior is the same. 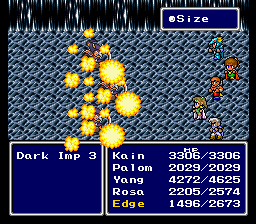 The real threat in this fight is Big Bang, which deals somewhere in the neighborhood of 2000 damage to the entire party. That's enough to wipe a lot of parties outright, but there's a catch. 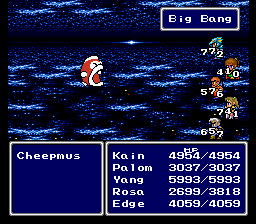 Zeromus trembles twice before shooting off a Big Bang, and if you cast a spell on him between the two shakes, his Big Bang will be considerably weaker. 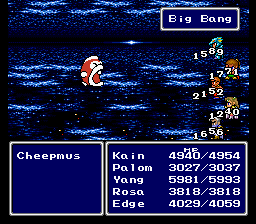 For the first Big Bang, you don't even need to time it -- any spell cast on Zeromus before his first Big Bang will weaken it. 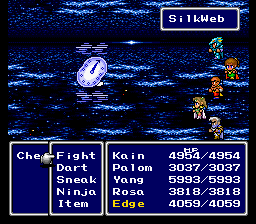 Our spell of choice is the SilkWeb item, which applies two stacks of Slow. You didn't think it would be that easy, though, did you? 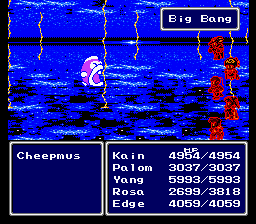 Zeromus counters all magic with Nuke, dealing almost as much damage as Big Bang, albeit to a single victim. Even if Nuke takes someone out, it's worth it if you manage to weaken Big Bang. It deals about a third of its normal damage. 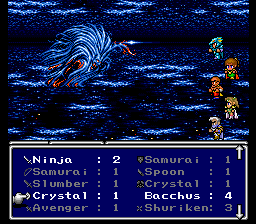 On the offensive, we have a Berserked Kain and Yang, Edge throwing our entire inventory at Zeromus, and Palom wielding a Samurai Bow and Artemis Arrows. 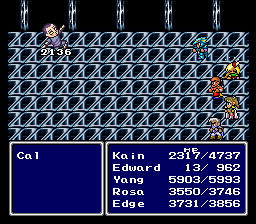 Kain and Yang hit for around 3000 each -- extremely often, thanks to how Berserk works -- while Edge starts at 9999 with Excalbur and the Spoon and works his way down from there. The second Big Bang of the fight hits us at full power. Note the highly variable damage. Big Bang is unaffected by defenses of any sort, so if you have party members under about 2200 health, it's a dice roll whether they'll live. 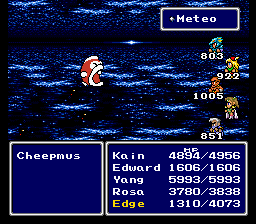 When Zeromus is on his last legs, he'll break out Meteo. This is it -- the strongest spell in the game. 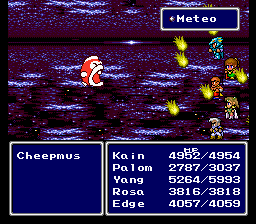 Zeromus's Meteo is strangely weak, though. When it doesn't miss outright, it deals barely-noticeable damage. 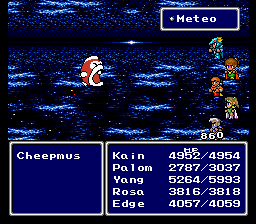 Meteo signals that Zeromus is at or under 10,000 HP. He's dead to rights by that point. And our journey comes to an end. We've beaten every boss the game could throw at us. Edward proves extremely resilient in the face of Big Wave! We can feel confident that bringing him along was the right decision. Our experience is doubled for having ten key items, and Edward's experience is further doubled because he's below level. He'll be in fighting form in no time. Not that this health total is exactly inspiring. Without Palom's Quake, we're forced to rely on Edge's surprisingly potent Ninja magic. 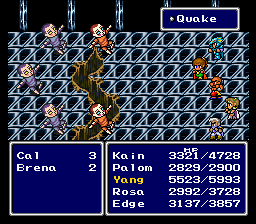 Still not as potent as Quake, of course, but we manage to clean up the remaining Cals before they can transform into Calbrena. With that, Edward cracks four digits of health. Trapped chests fill in the rest of the gaps. 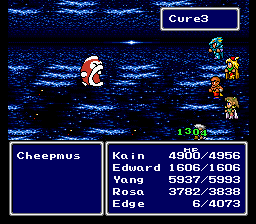 In non-boss battles, Edward automatically hides at critical HP, which buys him a free ride through these fights. 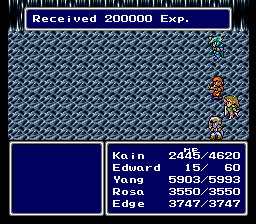 Edward's final health total is 1606. It's important to note how dramatic that jump is. 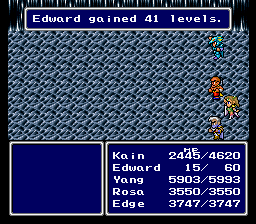 At level 48, Edward had 1028 HP. 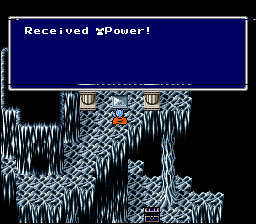 A meager eight levels later, he has gained half that much more. 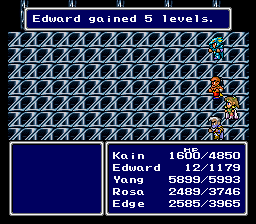 Edward's stat growths are a little wacky. If we could only get him a few more levels, he'd be looking surprisingly good. But we're forced to make do. 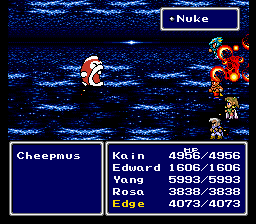 Edward eats the Nuke counter this time, which is unfortunate, but it does mean he gets to skip the first Big Bang. 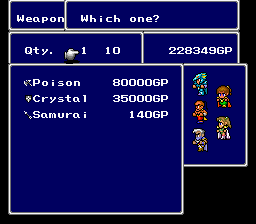 Edward, wielding the Samurai Bow and Artemis Arrows like Palom before him, deals about 2000 damage per hit. It's not really in the neighborhood of the big boys, but Yang and Edge have twelve levels on him. 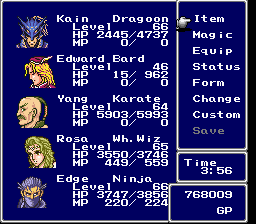 If Edward were pushing level 70, he might well outdamage his peers. 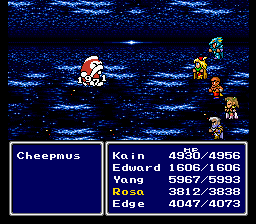 I attempt to weaken the second Big Bang with a cast of White from Rosa, and Zeromus counters with Weak. This is not something I was aware he could do. 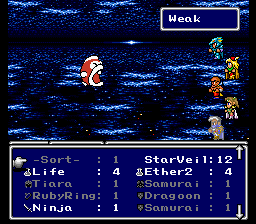 Weak sets the target's health to a single digit. That's particularly nasty in this fight, since Big Bang causes everyone's health to drain slowly over time. Edge survives by using a Cure3 on himself. It doesn't even come close to repairing the damage. Did we successfully weaken Big Bang? Will Edge survive it? We don't get to find out. 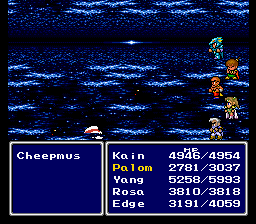 Zeromus enters the Meteo phase before Big Bang goes off. 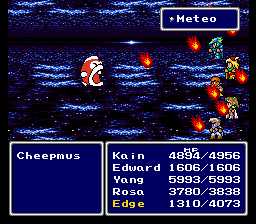 It's quite a bit more effective than the Meteo from the previous fight, but it still doesn't kill anyone. This is conclusive evidence that Edward is better than Palom. Thanks for the excellent LP, Mogri! These character appraisals are crazy, man. I mean, yeah. He’s better for that single fight. Any fighter generally is. Well, it's a stretch to call Edward a fighter, isn't it? Put Wall on someone, and bounce spells off that character. 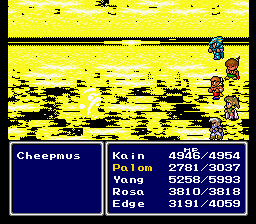 Reflected spells don't trigger counterattacks, and Zeromus's invisible health refill is considered a counterattack, so this can skip a good portion of this fight... though it's still probably slower thanks to the spell animations. Put Wall on everyone, and cast spells on Zeromus. 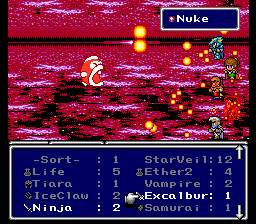 Zeromus will counter with Nuke, which will bounce back onto him. It's not usually worthwhile to set up Wall on everyone, though if you happen to have a good supply of MoonVeils, the Wall from those lasts a lot longer than StarVeils or the spell. The major disadvantage to this approach is that it's much harder to recover from Big Bang. Certainly, it's simpler to throw Berserk on a beefy front row and let them go to town, but a mage team can work against Zeromus. I feel oddly vindicated by this conclusion. This is my first post on Talking Time since getting internet access, to commend an awesome LP. Anyway, yes, Mogri, thanks for the Let's Play. This ROMHACK is super fun, and the people need to know. I wondered what had become of you. Thanks, and welcome back! 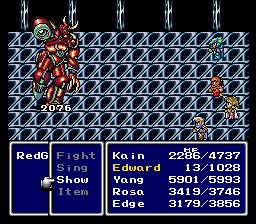 Well shoot, this LP made Edward look usable, and conjured Red Silvers back from the void. What can't it do?